“Ásatrú” is a modern coinage meaning “true to the Aesir.” In Old Norse, Aesir is the plural of áss, which is usually translated “god.” In order to understand what it means to be “true to the Aesir,” we must put into question this translation into “god” and “gods.” Indeed, ultimately we must liberate ourselves from the idea of “god” in order to understand who the Aesir are, and our relationship to them. Throughout this essay, I will therefore avoid the very familiar terms “god” and “gods” and instead use “áss” and “Aesir.” This is in order to accustom my readers to the fact that we are dealing with an idea that has become quite foreign to us. Some of us say that we “worship” the Aesir – though we will also have to put this idea into question as well. In any case, what may definitely be said is that adherents of Ásatrú relate to the Aesir as something other, and far greater, than themselves. Let us therefore begin by exploring what the difference is between human beings and the Aesir. We will find that this is not as easy to define as one might think. Could we distinguish ourselves from the Aesir by saying that we are “mortals”? No, for the lore teaches us that the gods are mortal, too. We have mortality in common with them. It is foretold that several of them will die at Ragnarok – including Odin, Thor, and Frey. The idea that humans are “mortals” and gods “immortals” is Greco-Roman, and foreign to the Germanic tradition. Could the difference between the Aesir and men be that the former possess special, occult powers and the latter do not? There are several major problems with this proposal. First, there are a whole host of non-human beings in Norse mythology who possess such powers. Thus, they are not exclusive to the Aesir. Probably the best example is the jötnar, usually translated as “giants.” The trouble here is that the giants are not giant; they are not gigantic in stature. In fact, their physical descriptions do not make them distinctively different from the Aesir (except that some of them – only some – are described as being particularly ugly). The giants possess physical and supernatural powers that put them on a par with the Aesir. Indeed, they often get the better of the Aesir (at least temporarily). The giants and the Aesir are also capable of interbreeding. The two groups are so close, in fact, that one might as well speak of them as constituting just two different varieties of “gods” – like the Aesir and the Vanir. And yet we do not worship the giants. Other beings in Norse myth possess superpowers – including the elves and the Norns (who mark out the fates even of the Aesir). A yet more significant reason to think that the possession of superpowers does not define the difference between Aesir and men is that men can actually acquire most of those same powers. In fact, based on what has come down to us, it is difficult to say with confidence which of the “divine” powers human beings cannot acquire. Rigsthula tells the tale of how the áss Rig (aka Heimdall) sired the various social classes of humankind. The child of Rig, who is the first of the nobility, is named “Lord,” and we are told that Rig taught the boy runes (Rigsthula, 34). Of course, this could mean simply that he taught the boy how to write in runes, but later passages suggest more than this. The youngest son of Lord is called King (clearly the first of the royals, as opposed to the mere nobles). King “learned runes, runes of fate and runes of destiny, he learned spells to save lives and dull blades, to calm storms” (Rigsthula, 41). We are also told that, like Sigurd, he learned “the language of birds.” And he learned further spells “to put out fires, to calm sorrows and induce sleep” (Rigsthula, 42; the context implies that this is magical knowledge). Amongst the spells known by Odin, and enumerated in Havamal, are those used to dull blades, calm storms, and put out fires (Havamal, 148-154). In addition to the galdr practiced by the Aesir, human beings can also learn seithr. Odin himself did not naturally possess knowledge of seithr, but had to acquire it from Freyja. Seithr may have involved shapeshifting, “astral projection,” and other “shamanic” powers. In Ynglinga Saga 7, we are told that Odin “often changed himself; at those times his body lay as though he were asleep or dead, and he then became a bird or a beast, a fish or a dragon, and went off in an instant to far-off lands on his own or other men’s errands.” But there are numerous examples in the Scandinavian sources that have come down to us indicating that human beings are capable of acquiring this power as well. We know, further, that human beings (at least some of them) possess the gift of prophecy. Odin himself does not prophesy, but has to rely on others to tell the future (see Voluspa, for example). For inspiration, humans partake of the poetic mead – but Odin requires it as well (indeed, he has to steal it from the giants). Not only can humans acquire the powers of the Aesir, but more importantly they can also surpass them. Returning to Rigsthula, we are told that Rig “shared runes” with King, but that “King tricked him, and learned them better than he, and then he earned the right to call himself by the name of Rig for his rune-lore” (Rigsthula, 43). Obviously, this can refer only to the magical uses of the runes, or at least esoteric knowledge of them. (It is most unlikely that the poem means merely that King learned to write runes better than Rig.) The idea that men can surpass the “gods” is quite unusual. We would have to look to the Indian tradition to find parallels to it. It is diametrically opposed to the attitude one finds in the Greek tradition, where human attempts to reach for the divine are “hubris,” and severely punished. Numerous well-known myths attest to this, such as the stories of Arachne, Cassiopeia, Icarus, Niobe, Phaethon, Salmoneus, and Tereus. 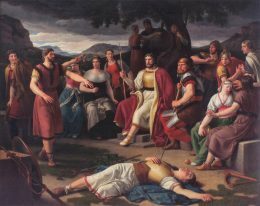 Such myths are conspicuously absent in the Germanic tradition (the various stories in which Loki is punished for this or that misdeed perhaps come the closest – but then he is not a human being). So far, we have had little success in identifying an essential feature that differentiates the Aesir from men. And yet there is obviously a difference; the relationship between the two is clearly asymmetrical. Men “worship” the Aesir, at least in the sense of appealing to them and sacrificing to them, whereas the reverse is not the case. I would suggest that the reason for this asymmetry, and the difference between Aesir and men, is the simple fact that men come from the Aesir. The Aesir are “worshipped” because they are the progenitors of human beings. Further, this relationship is understood in a literal sense. The Aesir are my ancestors in the same way that my grandparents are my ancestors. Three gods, powerful and passionate, left Asgard for Midgard. They found Ask and Embla, weak, fateless, in that land. They had no breath, no soul, no hair, no voice, they looked inhuman. Odin gave them breath, Honir gave them souls, Loth gave them hair and human faces. This account, which is the most-discussed “anthropogenesis” story in Norse myth, certainly does not suggest that the Aesir “sire” human beings, or that they are our ancestors in a “genetic” sense. In response to this, however, I would make two points. First, the story of Ask and Embla does depict the Aesir as infusing human beings with their own traits. But it is my second point that is actually more important: in addition to the story of Ask and Embla, Norse myth and legend contain a number of accounts which clearly depict the Aesir as ancestors of men, in the more conventional sense. We may note also the case of the Volsungs, a human clan sired by Odin as a tribe of elite warriors. The first of the Volsungs is Sigi, described as “a son of Odin.” In the subsequent tale, it is arguable that Odin intervenes a number of times in order to re-inject his own “seed” into the Volsung bloodline (e.g., the magic apple sent to Rerir, the sword plunged into the Volsung “family tree,” etc. – see my essay “An Esoteric Commentary on the Volsung Saga,” the first part of which appears here.) We should also mention the well-known fact that a number of Anglo-Saxon kings traced their lineage back to Odin. This relationship did involve propitiating the Aesir through sacrifice and ritual actions of different kinds. In the main, however, the Aesir were honored by being remembered – for that is generally the way ancestors are honored. The Aesir were remembered in the myths that were passed down from generation to generation. But so were our human ancestors, who were “worshipped” as well, just in the sense of being honored and remembered. This is why it was so vitally important to record the actions of human beings in the vast saga literature, and to remember them in verse and song. This includes the tales of ancestors who straddled the divide between human and “divine,” who were more-than-merely-human; men like Sigurd. Of course, it could also be argued that every ancestor straddles this divide – provided they are male and died violently. Those ancestors live after death in Valhalla as the Einherjar, Odin’s army of the dead. There they prepare for Ragnarok, passing their days fighting and killing one another. At day’s end, they are magically regenerated, and feast upon a magically regenerating boar. We may also note the importance that was attached to the naming of children. The Germanic tribes named their children after dead relatives, usually a direct ancestor. They believed that the “luck” (hamingja) of the ancestor would be passed along to the child. As Stephen Flowers has argued at length, this amounts to a belief in “rebirth.” In sum, it is arguable that the ancestors (at least in some cases) attain the post-mortem status of supernatural beings, and are venerated as semi-divine. So far, I have been arguing for a point that has been made by others: that Norse religion is essentially “ancestor worship.” However, I do not think this point is sufficiently appreciated by todays adherents to Ásatrú. To be true to the Aesir is fundamentally nothing other than honoring one’s ancestors – the greatest of one’s ancestors, to be sure, but still one’s own flesh and blood. The Aesir are greater than we are, but the difference is one of degree, not of kind. The Aesir should be seen as a tribe of special, powerful beings, who gave rise to the human tribe (or, at least, to the tribe of “the Germans”). Further, as noted earlier, the lore makes it clear that the Aesir were only one tribe of special, powerful beings. To us, however, they are uniquely special because they are our ancestors. As a final consideration, let us explore the way in which our ancestors – the Aesir, and these others – stand before us, as well as behind us. Imago is a Latin term associated with both entomology and Jungian psychology. In the latter, it was eventually replaced with the most well-known term in Jung’s work, archetype. In the former, it refers to the final stage of the metamorphosis of an insect (for example, the butterfly, fully formed from the larval caterpillar). This is also referred to by entomologists as the imaginal stage. The Romans used imago to refer (among other things) to any artistic representation, especially the imagines maiorum, which were wax masks of ancestors kept in the atria of prominent Roman homes. Putting all of this together, we may note that the Aesir – and the ancestors generally – play the role of imagines, in much the same senses as just mentioned. Clearly, the ancestors are archetypes: they “represent” certain qualities or ideals in the sense that they exemplify them. This applies, again, to both the Aesir and our human forebears. We honor them by remembering them and by striving to be like them; to become exemplars ourselves. We have seen that human beings can acquire the special properties of the Aesir themselves – and even surpass them. It is as if our lives are a larval state, in which we are gestating toward the imago of a god. (At least, some of us are.) Recall Rigsthula, in which King, through his magical attainments, “earned the right to call himself by the name of Rig.” In other words, he becomes identified with the god. We may note that it is not just individuals who seem to be developing toward the imago of the Aesir, or ancestors, but sometimes whole families. In the case of the Volsungs, each succeeding generation of the family is (usually) stronger and more powerful than the last, culminating in Sigurd, the greatest warrior in Germanic legend. Recall also that Rig only claims as his “sons” the later generations of humans he sires, who are noble, beautiful, courageous, and learned (especially in esoteric matters). Further, we should note that, for some, the achievement of the “imaginal state” occurs with their deaths: it is in death that they are perfected and raised to the ranks of the Einherjar, and all become “sons of Odin” (Gylfaginning, 20). It is in death that the perfection of the warrior is achieved, and he becomes the subject of poetry, song, and saga. The ancestors, including the Aesir, thus represent both the past and the future: an end toward which we are striving. In this orientation toward the ancestors, the past is constantly present to us, as an ideal. (See my essay “Ancestral Being,” the first part of which appears here.) To be true to the Aesir – and our other ancestors – thus means not only to remember them, but to live up to them. And, just perhaps, to surpass them. The Poetic Edda, trans. Jackson Crawford (Indianapolis: Hackett Publishing, 2015), 154. Snorri Sturluson, Heimskringla, trans. A. H. Smith (Mineola, N.Y.: Dover Publications, 1990), 5. For examples, see Claude Lecouteux, Witches, Werewolves and Fairies: Shapeshifters and Astral Doubles in the Middle Ages, trans. Clare Frock (Rochester, Vt.: Inner Traditions, 2003). 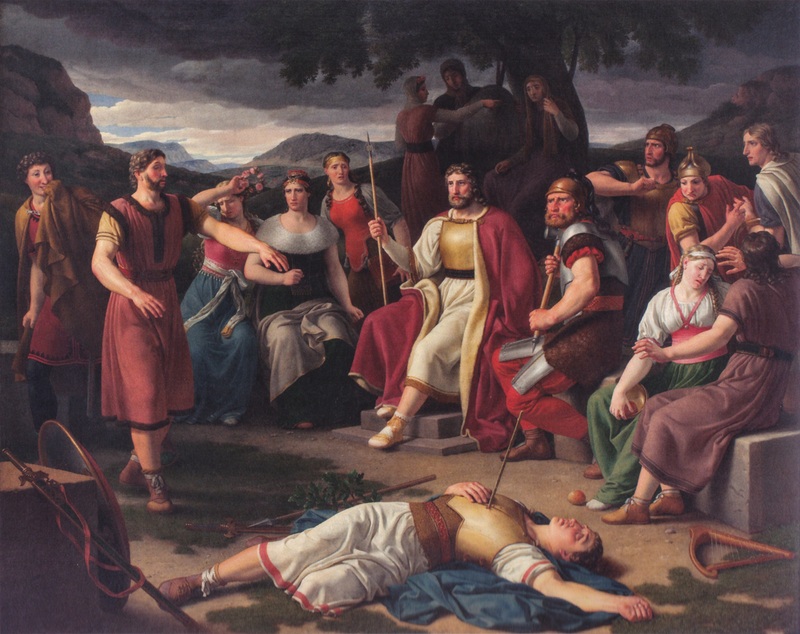 Though we should note that Freyr and his wife, a giant, had a son named Fjolnir (one of the mythological kings of Sweden), who then had human descendants. See Stephen E. Flowers, Sigurðr: Rebirth and the Rites of Transformation (Smithfield, Tx. : Rûna-Raven, 2011). Claude Lecouteux quotes the author of the Poem of Helgi: “Once upon a time it was thought that men were reborn. . . . It was said that Helgi and Sigrun lived again.” See Lecouteux, The Return of the Dead, trans. Jon E. Graham (Rochester, Vt.: Inner Traditions, 2009), 163. Published: March 15, 2019 | This entry was posted in North American New Right and tagged Aesir, apotheosis, articles, Asatru, Collin Cleary, Germanic paganism, Germanic tradition, heroism, North American New Right, originals. Both comments and trackbacks are currently closed. A really interesting subject and a delight to read, as always. I finished the Yoga of Power a while ago, after you recommended it. I am currently reading Tantric Traditions by Gwendolyn Taunton. I will have to read them over and over until I understand it all, but I feel that I have found a valid path to follow. I just wanted to let you know that I appreciate your work a lot and I that I find myself coming back to your essays all the time. The Tirfing cycle is very much about hubris, as is the Song of Grotti and countless fairy tales about interactions with the supernatural. I think you’re making a mistake when you take a mythology and try to interpret it as a philosophical system. That’s just not what myths are. They’re supposed to be full of contradictions and paradoxes, because they provide the framework within which something like rationality can exist. They’re not universal systems but cultural expressions of a time and place. In the American pagan scene there is a recurring discussion about “universalist” and “folkish” paganism, a dichotomy I don’t like in the first place. But the “folkish” Americans tend to also be “universalists”, in that they treat a particular (foreign and historical) culture as a system, instead of just acknowledging it as a valuable piece of cultural history. Christianity, Islam and Judaism are mythologies too. The distinction between myth and faith is not clear-cut, and it is only one that a non-believer would make. To a non-believer of Christianity, the biblical stories are myths. To a Christian non-believer of Ásatrú, the eddic stories are myths. Mythology is in the eye of the beholder, and so it is not really a useful concept to help us understand, or sympathise with, the ancients who believed in Germanic pagan religious systems. Myths are myths whether you believe in them or not. It’s a neutral term. But there is a vast difference in whether you put myths or systems first. Or rather, whether you think it’s even possible to put systems before myths (or reason before language, to use the discourse of the Counter-Enlightenment). When you pretend that an old myth is nothing but an allegory for a philosophical system, you’re not only making things up, you’re missing out on the whole purpose of the myth, which is neither philosophical nor rational, but something more fundamental than that. The idea that myths are myths, it is neutral, is merely in the eyes of the beholder. Christian believers will generally not believe that the Bible is a mythological book, Muslems will generally not believe the Koran is a mythological book, and so on. The ancient Germanic peoples did not believe their stories were, in fact, myths. Our understanding of ‘myth’ was not how they saw themselves, and therefore there is an incongruence/disconnect between our ways of understanding, which itself shows how far removed we are from our ancient White ancestors, while we brand their beliefs as myth. For as long as we do this, the misunderstsnding is inevitable, and we will forever, unlike the Chinese or Jews, look down on our ancestors and be self-hating based on our history. No other race hates themselves as much as we do and our historical perspective renders this inevitable, which is, perhaps, the original intention behind the Judeo-Christian religion: Severing us from our historical ties, i.e. dispossessing us of our own ancestral history which was passed down for eons so we would see our own way of life as glorious and right rather than mythological and objectively untrue, whence comes the ‘rational’ self-doubt and self-hate, which no other race shares with us. The idea that myth is not rational nor philosophical is itself a rationalist idea that dates from after the Judeo-Christian conversion of Germanic Europe, a seismic historical shift in self-perception and could only be maintained through a constant self-denial and self-hate. This historical perspective was racially sadomasochistic, although that sado part has occasionally proved useful to our race, which has had to defend itself from outsiders. But nevertheless, overall, this has been bad for us.